Ok so maybe all the cool kids aren't doing it... who wants to be a cool kid anyway? They have issues. So whats up with all this beeping? Morse code is fundamentally a method of encoding every letter in the alphabet plus numbers and punctuation as two pieces of data. Two sounds actually, one 3 times longer than the other. If you were to speak the two sounds out loud one would sound like DIT and the other DAH. That's it. That's all you have to know. Two sounds, one 3 times longer than the other. There, and you thought this would be hard? Pah! Beep Beeeeeep -- There you have it... Morse Code. Any questions? Why is it called Morse Code? Samuel Morse was a painter. Yep, a portrait painter. Ah, you're thinking he must have painted numerology into his portraits thus developing a "code". Nope, nothing so cloak and dagger. The motivation for his invention was due to a sad event in his life. While he was painting a portrait of the Marquis de Lafayette in Washing DC he received a message delivered by a messenger on horseback telling him that his wife at home in New Haven Connecticut. was sick. He received another message the following day informing him that she had died. He immediately returned home but she was already buried. Morse was heartbroken that his wife had been ill for days before he could receive a message. He decided to explore a means of long distance communication. Along with his assistant Alfred Vail they developed the primary language used in telegraphy across the world and collaborated with other men to design the mechanism to deliver messages in Morse Code over long distances. The rest is, as they say, "history"
Morse code has been in use for over 160 years, the longest of any electrical coding system. Morse code is still transmitted by some automated aviation beacons and the US Navy still (?) employs the code when using signal lamps for radio silence operations. Submarines have signal lamps in their periscopes. Morse code is still taught by the Airforce at Goodfellow Air Force Base in Texas. So that's cool but the main reason to learn and use Morse code is for use in amateur radio. CW (continuous wave) communication is the most energy efficient mode of electronic wireless communication that doesn't require computerized encoding/decoding. In the case of Morse Code the human is the modem. CW mode allows amateur radio operators to communicate world wide at QRP (low power) and QRPp (very low power) levels. CW's power density and simple transmitter/receiver requirements provides for simplified station operations and ideal emergency operations. You can carry a small, battery powered radio and some wire in your backpack and talk around the world. CW uses between 100Hz and 150Hz of bandwidth compared to 2400Hz - 3000Hz used by phone modes. That makes it about 20 times more efficient, or put another way, your signal to noise is improved by a factor of 20 over phone. It's also easier to copy (interpret) a CW signal down in the noise than a spoken voice. A 5 watt CW station can run off of AA batteries or a small solar panel and communicate locally, say across the county coordinating emergency services via ground wave, or to other continents for message exchange. 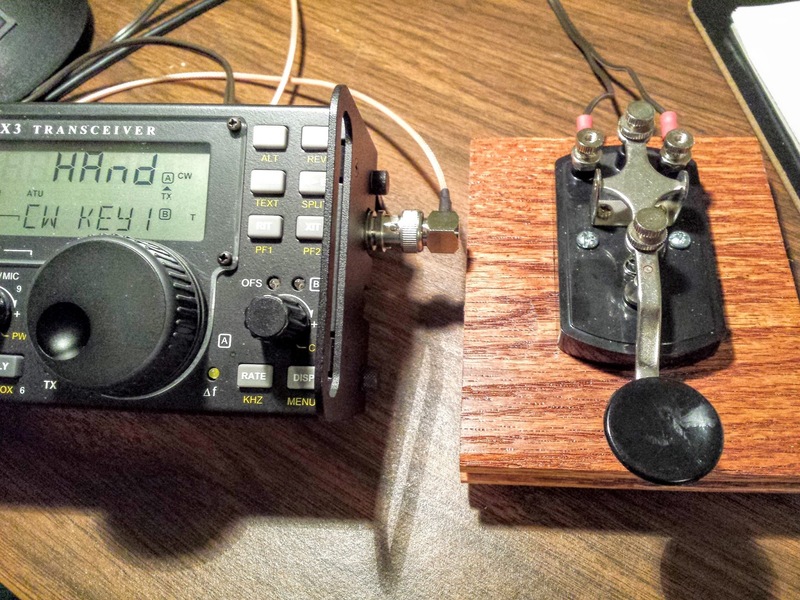 QRP radios operating CW are the ultimate fallback mode for emergency communication. But the real reason to learn Morse code is that it's fun and unique. Learning it can be the mental equivalent of climbing a mountain and, most importantly, all the cool kids are doing it. So you want to learn "the code"
Usually your first exposure to Morse code will be some chart that shows you what combination of DITs and DAHs (or dots and dashes) make up each character. This might encourage you to listen for the individual DITs and DAHs to learn the code. But it's a trap. There is a part of your brain that counts and another part that handles language. The part that counts will quickly hit a limit as to how fast it can count and interpret what you are hearing. The part that handles language is designed to interpret and transmit communication at incredible speed but the language part of you brain works with sound. Thus you have to approach learning Morse Code as a language by the way it sounds. An "A" sounds like DIT DAH. Say it out loud a couple of times, go ahead, don't be embarrassed, the people around will simply think you've finally lost it and pull out that power of attorney they've been keeping in the drawer. Ok are you saying DIT DAH? If so you are hearing the letter A. Congratulations, you just learned the first letter of the alphabet in Morse Code. A "C" in Morse Code sounds like DAH DIT DAH DIT. It has a beautiful rhythm when you listen to it out loud. Go ahead and shout it out, you've got nothing to lose at this point. So, if you have toyed around with learning Morse Code and have some visual chart with dots and dashes. Shred that chart right now. Go ahead and do it. I'll wait... Did you shred it? Ok let's proceed. There are probably as many ways to learn Morse Code as there are days of the year but I'll address the two ways I learned it. First, a wrong way, then a right way. Morse Code was a requirement for my General amateur radio license in 2006, but I only had to prove copy skills at 5 words per minute. Someone recommended a set of tapes that employed mnemonic phrases to memorize each letter. Basically each letter "sounds" like some phrase. I'm going to tell you one of the mnemonic phrases as an example but please immediately erase it from your memory because it takes a long time to un-learn this method. The letter "Y" sounds like the following phrase said out loud "Why did I die?" OK, now just imagine you've memorized some phrase like that for every letter of the alphabet and punctuation mark. Now every time you hear a letter in Morse Code one of these phrases runs through your head and you have to let it run its course before the letter pops out on the other side of your consciousness. You can understand how crippling this becomes when the speed goes above 5 words per minute. Trying to counts DITs and DAHs hits the same wall. I'm not going out on a limb to say there is only one right way to learn Morse Code so I will say that what follows is "One right way" to learn the code and it is working for me. Learn the code by its sound. Learn the code by its sound. Learn the code by its sound. Let's review: Learn the code by its sound. There are lots of different software applications out there that will teach you the code by the way it sounds. Many employ two well established methodologies; the Farnsworth Method and the Koch Method. Learn the sound of the letters at the full target speed you wish to be able to copy. Keep the speed of the letter spacing (silence between the letters) to be at your current learning speed to give you thinking time. I.e. you're letter spacing may be set at 8-10wpm to start out with while you're actually learning the characters at a target speed of 20wpm. This method is recommended by the ARRL and is implemented by many applications used for Morse Code training. This allows you to learn the sound of the letters at the full target speed you want to operate at. If you learn the sound of the letters at 13wpm then you will find yourself stuck there until you relearn them at a higher speed because you're learning to recognize sounds, not DITs and DAHs. Our brain has an easier time of slowing a sound down than speeding it up so if you start at the target speed the slower speeds will work themselves out. I started with a target speed of 18wpm and I am kind of stuck there right now, while learning the sound of the characters at a higher speed to progress. I wish I had originally chosen 20wpm as my target speed because in my experience that is a common speed in many QSOs. Your training should also incorporate the Koch Method which directs the order in which you learn the letters, numbers and punctuation and determining when to progress to the next element. Begins with just two characters (K, M). Once strings containing those two characters can be copied with 90% accuracy, an additional character is added, and so on until the full character set is mastered. I looked at a number of different code trainers. I tried PC applications, mobile device apps and internet based applications. I live in a very internet connected place and I nearly always have access to the internet. I don't always have my PC with me but I do usually have access to a guest PC or a mobile internet capable device so I chose a website that has a training application that incorporates both the Farnsworth and Koch methods and would keep track of my progress. Learn CW Online is a really nice Morse Code tutor. You create a login for it to keep track of your progress and settings for character speed and effective speed. It has multiple ways to train so try the different ones out to find out what works best for you. I used the Koch Method CW Course which is accessible after you log in. It starts out with two letters and keeps track of your accuracy, making suggestions as to when you should add an additional letter. There are 40 lessons in that course which include the alphabet, numbers and punctuation. I've read that other people really like the MorseMachine application on that site. After you've gone through all 40 Koch lessons you may still have trouble with a particular set of characters. Use the Code Groups application to work through your stumbling blocks. Lastly natural language training is provided in the plain text training application which sends real sentences at your speed settings. You can also paste text into the convert text to cw application and download the resulting MP3 to practice off-line. Machine learning is patient tutor and the best way to get started but after you have learned your letters and numbers and a comma you should incorporate copy of real on-air QSOs into your learning regimen. Copying real QSOs will teach you a couple of things. First, you'll realize that people by and large do not send perfect, machine generated code. Much of the slower code you will hear on HF is being sent with straight keys, bugs and cooties. Some of these manual key operators will send with timing that is, let's say, creative. At first you may be dismayed that you can't copy a single complete word from some of these operators but give it time and your brain will adjust to the unique cadence used by many manual key operators. Some manual key operators pride themselves in their distinctive style of sending and there are a few operators that I recognize before they ever send their call just by the unique style of their FIST. 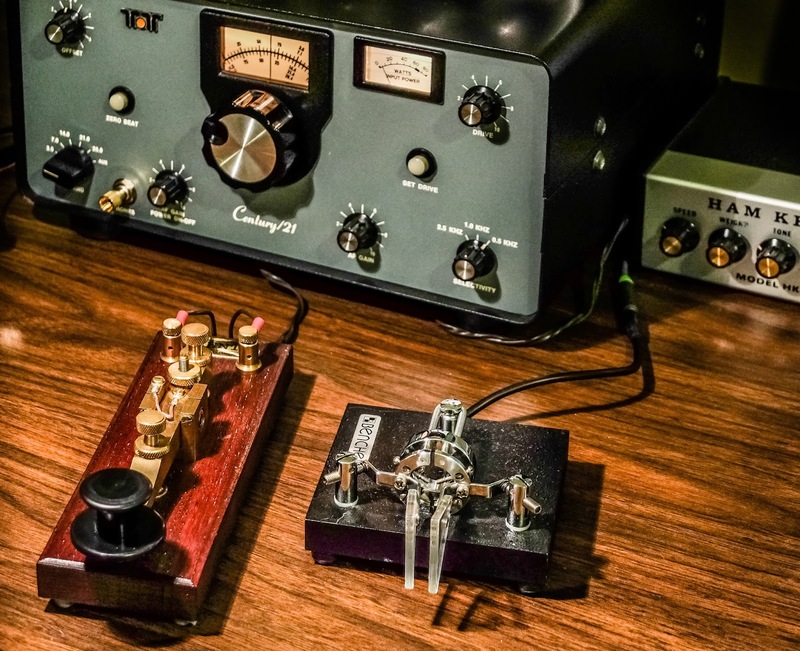 I'm not encouraging you to emulate that style because it is in essence communicating with a thick accent but you should begin to become familiar with hearing the code sent by these folks because you will eventually have QSOs with them. Even operators using paddles and electronic keyers won't sound like the machine generated code because their letter and word spacing will vary, or in some cases, be nearly non-existent. I describe some operators FIST as sending one extended prosign (no space between the letters) for an entire transmission. Secondly you'll begin to start copying the myriad of abbreviations and prosigns and jargon used during QSOs that exists nowhere outside of amateur radio CW conversations. As you come across new "words" that you copy. Circle them until you begin to recognize what they mean. Some of the abbreviations are standardized but many others are just shorthand and sometimes unique to a particular operator or region. You'll also start to become familiar with the way operators communicate their goodbyes which vary greatly in content, abbreviations and length. Some goodbyes in morse code seem to take as long as the entire previous part of the QSO. In other cases the conversation ended and you didn't even hear the door slam behind you. There are a number of Morse Code translation programs available for mobile devices and computers. My recommendation is to NOT use them when you're learning to copy. They will become a crutch and in real QSOs they tend to not be accurate (excepting for CW-Skimmer) and will get you distracted from trying to actually copy the code yourself. Where they ARE USEFUL is in translating your own sending (see below). The most important thing is to have fun. No one makes their living as a telegraph operator any longer and the code is no longer required for a license. So don't stress out about learning the code or push yourself too fast. This is just a hobby and hobbies should be fun. If you can, practice a little every day. When you start, if you're like me, you will find that you mentally tire out after about 15-20 minutes so don't push it. You are exercising a part of your brain that hasn't had to work much since you learned to talk, and that may have been a few years back. Different people will learn at a different pace but I haven't met anyone that doesn't make progress if they keep plugging away at it a little every day and if you miss a day no big deal, just try not to let it lapse. You are building a new muscle in your brain. You may also hit a couple walls along the way where you don't seem to progress but it's coming. Just be patient. Morse Code is not fast food. Morse Code is a mode for folks that don't have a lot to say but want to take a long time to say it; so why rush? Learning to send code is a different skill than learning to copy. Your ability to send good code is primarily formed by your ability to hear good code. You have to be able to hear the code as properly timed sound bites in your head before you can expect to send properly. Personally, I'd recommend that you hold off practicing sending code until you have worked through all the lessons and can properly copy. Your brain needs time to memorize the proper sound for each letter. If you start practicing too soon you could develop poor timing habits that will take time to correct. When you are ready to practice; try sending something like a news article. Or write a few sentences about your weekend and practice sending them. At some point you should begin practicing simulated QSOs. The SKCC beginners corner has a good sample QSOs to practice. When I started real over the air conversations I had my QSOs written out with blanks for the other station's call-sign. I didn't try to stray far from the text in the beginning since trying to think of what to say while spelling it in my head and remembering the sound for it was just too much for my puny brain. But after a couple dozen real QSOs the nervousness starts to wear off and you can think and send. I have had a little over 300 CW QSOs now and while that is still a relatively small number easily a 3rd of them have been lengthy ragchews lasting over 20-30 minutes so I've spent a lot of time "off-script" from the standard exchange. At this point I don't have to concentrate much on what I'm sending, it just comes out. I only have to think about spelling long words. When you practice I recommend that you record yourself and then go back maybe a day later and see if you can copy what you sent. You will think you're doing great until you listen to yourself. Then you will practice sending more carefully! Remember the golden rule. It's better to send good code than receive. Another useful practice tool for sending is a Morse Code Translator but as stated previously only use a translator to work on your own code sending. Don't use one to copy in real QSOs or you will become dependent on it. Of course there are different opinions on whether to learn to send code with a straight key or a paddle with an electronic keyer. They each have their merits and detractors. I wouldn't recommend starting with a cootie (sideswiper) or bug, they introduce too many variables for a beginner. Straight keys are simple, inexpensive and can work with many inexpensive practice oscillators such that you don't need a radio to practice sending. The disadvantage of straight keys is that your reflexes are entirely responsible for properly spaced DITs and DAHs in addition to intra-character and word spacing. The advantage is that after some practice they become an extension of your arm and simply repeat what you're hearing in your head. I personally started with a straight key and still like to use one for the majority of my QSOs but it's a personal preference. A paddle works with an electronic keyer. The disadvantage of a paddle is it requires additional equipment and that you will be learning a different reflex from the actual code that is in your head. I.e. when you send an I or an S or an H you are not reflexively sending the DITs that make up the letter but are instead training yourself how long to depress the paddle for the string of DITs. This is a new skill and doesn't directly correspond to what you hear in your head. The advantage to using a paddle with an electronic keyer is that the keyer will send perfect length and ratio DITs and DAHs every time so your reflexes don't have to be as quick or precise. Also it requires far fewer movements of your hand to send code with a paddle and you won't tire as quickly as you would with a straight key. I won't go into the concept of squeeze keying here. For now don't worry about it. The electronic keyer may be external or built-in to the radio. If it's external then it will normally have a speaker or mic jack to provide a sidetone allowing you to practice without connecting to a radio. If you don't have an external keyer and want to practice with a paddle you will need a radio with a built-in electronic keyer and be aware how to set it to not transmit for practice. Usually this is accomplished, strangely enough, by turning off VOX (which stands for voice activation) in the radio's menu. Keyers have a speed setting and weighting. Speed seems pretty obvious. Weighting is the ratio of the length of the DIT to the DAH in length. In general the weighting should be set to a higher value when you are sending at a slow speed and set to a lower value as your speed goes up. So now you've practiced your copy skills and you can confidently copy on-air stations at the speed you wish to operate. You have also been practicing sending and when you listen to a recording of yourself it actually makes sense. If you can find a local ham who already knows the code to practice with that certainly makes for a less intimidating first foray. If you don't know anyone ask your local 2m repeater club if they have any CW Elmers who are within ground-wave distance of your station to work with you. Barring that ask someone in a forum and see if you can schedule a QSO but scheduling QSOs is often hit or miss based on propagation. If none of those options present themselves then just go for it on-air. Find an ongoing QSO that you feel you can copy or is moving just slightly faster than you can copy. Copy the call-sign of the station you can best copy and wait for them to sign with each other (they will each send their 73s / 72s and send a DIT DIT at the very end). Then call that station. If you've been listening to regular QSOs you'll recognize the form above. The repetition of the other station's call is to get their attention. You repeat yours for their benefit. The PSE QRS is asking them to slow down and the prosign KN means you're asking only them to respond. Have a prepared QSO text ready in terms of what to send. The SKCC beginners corner has a good sample QSOs. Here is a sample QSO from when I was just venturing onto the air. 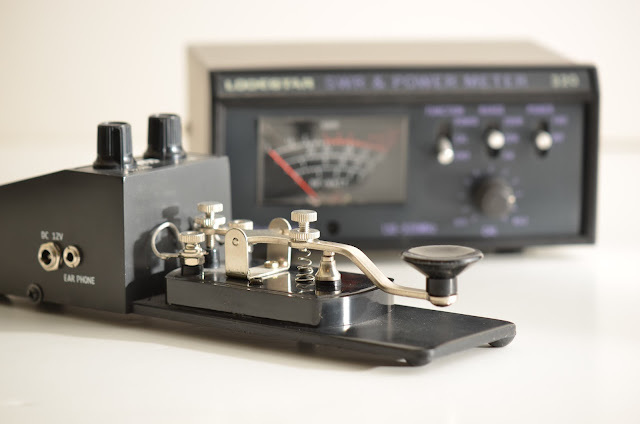 As far using Morse Code in radio communication is concerned; a transmitter modulates a 100Hz to 150Hz wide signal called a Continuous Wave or CW at a particular frequency. The time the signal is transmitted corresponds to the length of time the trasnmitter key is depressed. When listening on a receiver you hear a tone whose pitch is determined by your offset from the frequency of the transmission. If you are listening exactly on the same frequency you will hear nothing because there will be zero Hz offset. So most modern receivers offset the receiver frequency above or below the signal and offset their own transmit frequency by the chosen offset. So if the offset is 750Hz you will hear a 750Hz tone if you are exactly on frequency with the other station. Confusing? Good, you're well on you way. So you know as much as I know now... well admittedly I don't know a lot, I'm just learning this stuff myself but I can almost promise you that it will be fun if you have some patience with it and you will meet some of the nicest people in ham radio... well meet them virtually, well meet them as monotone beeps, well meet them as decoded signals sent from one human computer to another human computer, but trust me; after you've had a 15 minute conversation with them and only exchanged your names, where you live and what the weather is you'll feel as though you've known them your entire life. Richard Carpenter, AA4OO, is a regular contributor to AmateurRadio.com and writes from North Carolina, USA. Contact him at [email protected]. Good advice. I hang out on 7112 – 7115 in the afternoons. The first time I became aware of Amateur Radio was in Lima, Peru, South America . Where my parents were spending 5 years as missionaries back in the 1950’s. A Peruvian friend of my father told us to come to his office to see if we could make a SSB auto patch with another amateur radio operator in California. Our family went to his office and the propergation was just right an we talked for :30 minutes with my grandparents. This was the first time in five years due to the cost of phone service to USA. I was all eyes during that 30 minutes. After that amateur radio contact our churches mission stations in the Peruvian Amazon jungles obtained radios to contact the churches headquarters in Peru. When I returned to USA for my education , I heard stories about the Titanic’s SOS calls on CW. Navajo CW operators during WW ll. with no problem. At that time they required CW for all licenses. Then I heard morse code was not required any more. So July 1995 was my Tech. license, June 15, 2015 my General license . In between these two previous dates I have had two back fusion surgeries. My goal was mountain top QRP SSB. Mountain hiking and backpacking is out the question now. Yes, I am enjoying this retirement hobbie. I just wish I could have started sooner in my life. Education , career, and family life sometimes postpones your dreams. with a small CW rig and small battery pack or do some QRP on the beaches here in Florida. Enjoy the Thanksgiving Holiday you all.